This past February a new EMEA board was elected for a two-year term. I hope all is going well for everyone as Spring comes along. This is our first EMEA newsletter for the year and plan to use this format to share with you current information that is going on with EMEA, The Eastern Divsion, and NAfME. The EMEA board and I are excited to be planning some exciting events for our Fall Conference in November with great presenters. We will keep you posted as we move forward. Please let us know how we can help and support you and your schools. 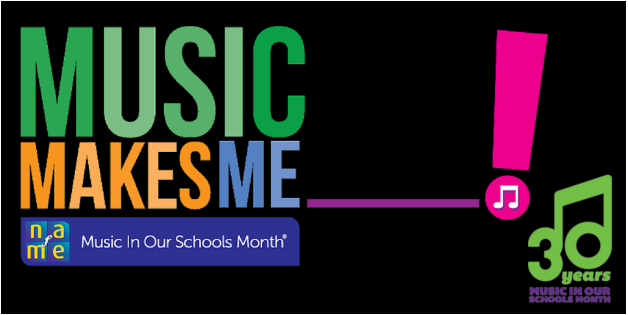 MUSIC IN OUR SCHOOLS MONTH. This year marks the 30th Anniversary which engages music educators, students, and communities to promote high quality music programs in schools. EMEA MEMBERS: We want to know how you are celebrating MIOSM. Change your profile picture on Facebook and/or Twitter for the month of March! The NAfME Eastern Divsion Conference is coming up in April. This year the conference will be in Providence,RI. Don't forget to renew your membership. Our Executive Manager Deborah Barrows will keep you posted when it is time to renew. If you have any questions regarding membership, please contact Deborah.